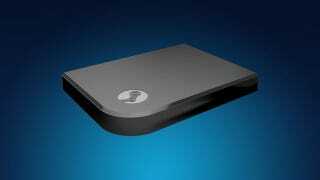 Been waiting for an officially endorsed Steam Machine? Well, here it is, sort of—the Valve Steam Link. It's a tiny, $50 micro-PC that seems to do absolutely nothing but pipe PC games in over a local network via Steam-in-home-streaming. Want a Steam Controller? You can get that too, but it'll cost you an extra $50. Both will launch in November, but the barebones Link isn't the only official Steam Machine landing this year. Valve announced that new PC Consoles from both Alienware and Falcon Northwest are on the way, with yet more machines launching this fall. It's been (and still will be) a long wait since Valve promised to take over the living room at CES 2013, but it looks like it's finally happening.